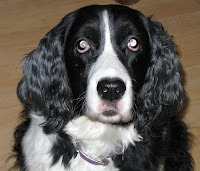 My 10-year-old Springer, Tish, is a graduate of The Right Paw obedience school, but I'll be the first to admit that I've often slacked in reinforcing the commands that she learned there, so many years ago. But recently, I've been inspired, and even awed, by watching British dog trainer, Victoria Stilwell, on the Animal Planet series, "It's Me or The Dog." Week after week, Victoria confronts all manner of canine chaos, and by the end of the episode, she has calmed everybody down and brought order, peace, and tranquility to a formerly dog-crazed household. She relies on positive reinforcement, clicker training, and a quiet firmness, and never seems to lose her cool, even when everyone else seems hopelessly out of control. So of late, I've been using Victoria's methods to work with Tish, particularly as she flies around the house, barking her head off, at mealtimes. And I'm seeing results. But this morning, I decided to see whether I could send my commands to Tish using telepathy alone, without any hand signals, eye movements, body language, or spoken words. With Tish on the leash, I calmly sent her the thought, "Come, and sit." At first, she just looked at me, realizing that there was something I wanted, but seemingly not "getting" it. I didn't move, but I kept repeating mentally, "Come, and sit." I took a deep breath. And within about two minutes, Tish walked over to me and sat down. It worked! I was able to successfully repeat this experiment and each time that Tish came and sat down next to me, I effusively praised her. Tish's quick response to my telepathic messages has inspired me to "up the ante," and once I'm sure I can consistently open the telepathic training connection with her at will, we'll see how far it can take us. If you'd like to try it, I'd love to hear about your experiences using telepathy to send commands to your dog, too.